The South African flag is one of the National symbols that makes the country unique in its own way. A national flag is used to represent a country without having to use its name. The flag of South Africa is flown at the front of all government buildings. Individuals and private organizations like banks have also taken the liberty of flying the national symbol. The flag of South Africa was designed by the then State Herald of South Africa Frederick Brownell in March 1994 and was adopted on 27 April 1994, at the beginning of South Africa’s 1994 general election. This was done to replace the flag that had been used since 1928. The present South African national flag was first flown on 27 April 1994, which was the day of South Africa’s 1994 election. Choosing a new flag was part of the negotiation process that was set in place when Nelson Mandela was in 1990 released from prison. For those of us who do not know and have been researching about this, the South African Flag was designed by Frederick Brownell who was the then State Herald of South Africa. It was designed in March 1994. Frederick matriculated from St. Andrew’s School in Bloemfontein in 1957 and was 54 years of age when he designed the flag. He has designed many coats of arms, badges and flags, including the arms and the flag of Namibia in 1990. Brownell was awarded the Order for Meritorious Service by President Nelson Mandela in 1999 for his role in designing the South African flag. 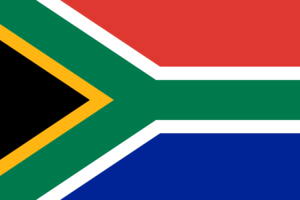 The South African flag has six colours: Green, Black, White, Gold, Blue and Red. Green represents natural wealth, while white represents peace. The design and colours of the South African flag are a synopsis of principal elements of the country’s flag history. The colours actually do not have any essential meaning. Black, Green and Gold yellow are found in the flag of the African National Congress. Red, White and Blue are used in the modern flag of the Netherlands and the flag of the United Kingdom; the colours white and blue were also found in the old flag of South Africa. The national flag is rectangular; it is one and a half times as long as it is wide. It is black, gold, green, white, chilli red and blue. It has a green Y-shaped band that is one fifth as wide as the flag. The centre lines of the band start in the top and bottom corners next to the flag post, converge in the centre of the flag and continue horizontally to the middle of the free edge. The green band is edged, above and below in white, and towards the flag post end, in gold. Each edging is one-fifteenth as wide as the flag. The triangle next to the flag post is black. The upper horizontal band is chilli red and the lower horizontal band is blue. These bands are each one third as wide as the flag.